[CapnJackHarkness] based their build on a table made by Gaminggeek, adapting it to their space and needs. The main difference? 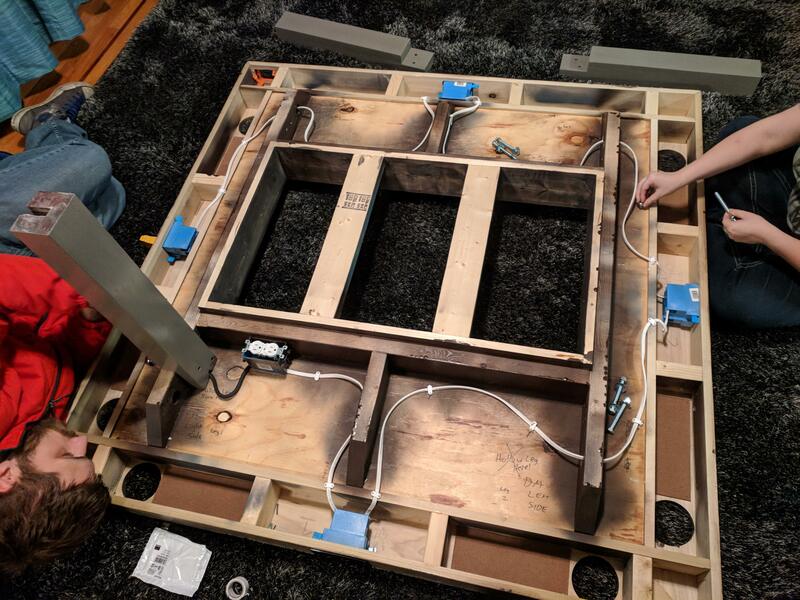 This wasn’t exactly ‘cheap;’ between needing to purchase tools and a 39″ TV, their cost was around $1,000 — the poplar alone coming in between $200-$400. Additionally, those foam pads have been a functional nuisance so far, so they’re planning on replacing them with speed cloth or felt down the line. While the game space displayed on the TV is handled by roll20, that doesn’t mean [CapnJackHarkness] or their friends can’t add a few extra props to their sessions. Interesting but why not go back to the original game? I’m old school but I really liked the game without all the tech stuff. Now if you can create a hologram that looks realistic and fights monsters et al, I’m certainly interested. TV is cool idea but wouldn’t a large monitor serve the same purpose connected to a laptop? Not knocking it for anyone else, just my personal opinion and you know what they say about that, everyone has one. Look very, very closely at the picture – the TV *IS* being used as a large monitor connected to a laptop. So is it a computer monitor or is it a TV? Why use it in the first place? Nice woodworking on the table but I prefer playing the old way. The differences are mostly in features and price. A 40″ TV is under $200 at Walmart right now. Monitors anywhere near that large tend to be 4k or curved and so command a premium, most are at least $400, closer to $600 or more. A television has a tuner and a user interface that may be useless without a remote control, a monitor has a resolution appropriate for it’s size at a viewing distance of an arm’s length, no tuner, and a UI that is set with buttons on the device and then forgotten forever. A television tends to have some analog input options for composite and split video signals along with HDMI, while a monitor will tend to have an RGB input (VGA) if any analog, as well as some displayport or DVI ports in addition to HDMI if present. Unfortunately, some TVs(not all, but enough to make shopping for them a bit of a chore) do things that make them serve as poor monitors. The wonders of overscan are, at least mostly, over(as you’d damn well hope when handed one of the digital inputs that even sub $100 trash monitors can interpret without trouble); but weird processing settings designed to make the image look better under the harsh light of Best Buy, wonky EDID, or awful subpixel tricks (RGBW might be a clever exploitation of human luma sensitivity being greater than chroma sensitivity; but it does some awful thing to some not uncommon computer display use cases). A TV is still going to be vastly cheaper than a monitor if you want something large, so it can be worth just trying to find the least-worse option; but it’s kind of sad how many character defects you can still run into..
For me personally, I’d use the display for mapping — and put miniatures on it. The map is the single hardest part of the game to me. Really using miniatures would be the only reason to embed it within the table. I’ve played a couple of one-offs with my kids and I used Roll20 as-is set up on a large TV at the end of the table. On Roll20, a single “player” had control of all their characters and they just moved their own tokens on their turn around using a couple of shared mice. Character sheets were pen & paper and dice rolls were real dice. I used a Roll20 on a laptop to control the other tokens and automate some of the npc/creature rolls (saves, attacks etc) which is really easy to do if you have them prepared (Taking20 on YouTube has some great tips on making a Roll20 monster manual you can just drag-n-drop on to a map). I would use the display much like it appears to be used in the photo above, as a dynamic map. And then put miniatures on top of it. I like having a map to give an idea of what’s going on, and it would be a lot easier if I could change the map with a button push or two. They may have gone with a TV because it’s typically easier to find a TV with a viewing angle usable for table top viewing than a monitor. I built a lovely monitor mount for a coffee table I had rebuilt. Did all of the setup and fit testing with an unplugged monitor. Turned the finished product on only to find out that you could barely see anything unless you were standing directly over it. Waah waaaaaah. Yikes. Great idea, poor execution. Really needs a glass (or plexi) cover over the whole thing. TV’s too small. This is gonna be impossible to clean, and spills will be redirected straight where you don’t want them to go. Heck, I know people with crazy metal dice that could wreak havoc with that screen surface. Was thinking the same. My Dice tower got ripped apart by my mates metal dice. Looks like it needs a liberal application of scratch resistant acrylic. Would be very cool, but short throw projectors are expensive. Besides, mounting it under the table would limit your desire to dig it out and reuse it. If you projected from the ceiling onto the tabletop, at least the projector could swing on its ceiling mount to aim at a wall after. Projecting an image from the floor would not produce an image most would call ‘large’ – as an experiment, take your current projector, put it 29″ away from the screen and tell me how “large” your projected image is. Put a polycarbonate cover over the TV that extends at least an inch past the edges. Route a groove in the bottom of the cover, about 0.25″ back from the edges. That’s a drip groove so that spills can’t run back on the bottom side and get to the TV. Split some PVC pipe lengthwise to fit all around for a gutter, angled to a drain and catch bucket. Could dump a 44oz drink on it and the TV would be safe. Just pull up the edge cover (which would of course be supported so it doesn’t set on the clear cover, so liquids won’t get on it), mop up the clear cover. then take the clear cover off to fully clean and get at the gutter to clean it. “I went with poplar on the parts that are going to have the most human contact (legs, top and outside skirt, because pine is so dang soft”–that’s a good thought, but depending on the pine species, poplar isn’t necessarily harder (http://tinytimbers.com/janka.htm). I suggest rounding over the edges of the dice trays. I want a gaming table like this so badly! Unfortunately, space is at a premium in my house and I don’t currently have the time to put the table through its paces properly. Great build out and the suggestions in the comments are pretty awesome! I’d like to make a table with a map that moves and the miniatures have to keep moving not to get killed by touching the end. Like a motorized pull down blind. Time is ticking and no stopping. Adds a real sense of eminent death to the game. Anyone want to make one with me and we’ll try it out? maybe add random lights below to act as explosions, poison gas, fire etc.